Erica Bauer-meister says she was happy to have published her first novel two months before she turned 50. That first book was the surprise hit School of Essential Ingredients. 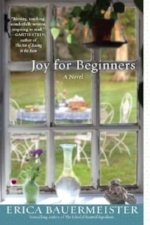 Joy for Beginners, her second novel, is garnering rave reviews, and Erica is hard at work on her third. She lives in Seattle with her husband and doesn’t mind the rain.